Description: CSXT CW60AC 689 splits the foggy Magnolia CPL's with a westbound trailerjet. Description: Q420 passing MP 135 at Ballou's. Description: With a monster lashup CSX train Q273 creeps north getting ready to head back south for more autoracks. Description: Q273 is now on the move again and is heading north towards Selkirk with all of the pick ups done. Description: X116 rolls through CP-98 after making a drop at West Springfield yard just across the River. Description: Hey look, no horsepower to the left and 6,000 horsepower to the right! Description: CSX train Q109 glides past the Depew, NY Amtrak station in an unexpected Christmas Eve snow storm. 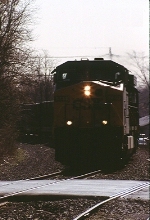 Description: CSX Q-131 races west on the Indianapolis line. Description: CSX Q-131 races around a curve just west of Chesterfield on the Indianapolis Line. Description: Q268 eastbound at Amsterdam. The trailing unit was ex-Seaboard System 4601. I had hoped it would return over the next two days I was here. Never saw it again. Description: Next up is NB CSX Q406 which has been sitting behind F774 The Rocky Mount to Boykins Turn which needs to get on to the Portsmoth Sub, but the Dispatcher has run him through the crossovers at S. Weldon to run around F774 while he waits for Q446 to clear some blocks on the DTC controled Portsmouth Sub. You can barely make out F774's lead unit between the last car of F730 and the Q406 consist. While F730 still patiently waits its turn. Description: Q161 westbound at Broadway. Description: Q121 streaks south past the yard at Guthrie. Description: Q425 westbound at MP 127.